After the birth of my first child in the United States, my husband and I moved to a third world country. I soon discovered what social medicine is like in a developing nation. When our children got sick, instead of making an appointment with a doctor, our only choice was to head for the hospital. There was only one hospital to serve several thousand people. Back in 1974, we were lucky to only wait three or so hours for a doctor. There were no comfortable chairs to sit on. There were concrete slab that we could rest on. There were so many coughing, feverish and injured people waiting for help. We worried that if our child was not already seriously ill, she would be after we left the hospital. Doctors had been trained in a third world country, usually Fiji. There was no state of the art equipment. Doctors are lower paid than teachers in Tonga. If we required a blood test, the closest laboratory was miles away, and the results would take two weeks or more. If a prescription was given, we would head for the dispensary located in the hospital. We received medicine that had already expired, having been donated from a charitable organization in the United States or elsewhere. Less than a year after we moved to the third world country, I had my second child. This was a very humbling experience for me. The hospital was full and I ended up having my baby out in the waiting area. Several people I had never met before gawked at me as I gave birth. The hospital had neither disposable diapers nor a nursery. My baby had gastroenteritis and cried most of the time, and there was no doctor available to check on him. I went home from the hospital with a 103 degree fever and a sick baby. Family members are expected to take care of the patients at the hospital, and I had none of my own family living there. My husband’s parents were living in New Zealand at the time. Thankfully, traditional knowledge has been passed down from generation to generation. It is crucial to the survival of the people of Tonga. Many have embraced a Western diet, and experience poor health as a result. 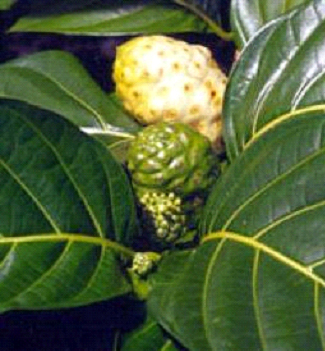 Medicine made the "old way" utilize tropical plants, gifts of the sea, leaves from certain bushes and roots. 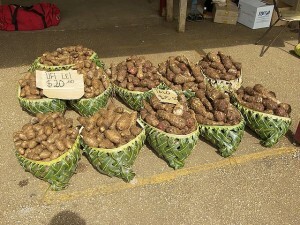 Many families in Tonga treat their children with these natural resources. Most villages also have a “witch doctor” who is known for their success in healing through their own methods. My two young babies got thrush, and were unable to eat anything for several days. They also had fevers, because of the infection in their mouths. I was so worried and took them to the doctors at the hospital. They gave me rinses and other medicine, which I used faithfully, but my babies were not getting better. After several days of this without improvement, the babies were taken to the local village healer. 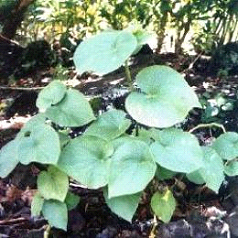 The healer mixed several ingredients together including noni, kava and burnt coconut. She ground it up and poured it into the babies mouths. They cried and fussed, but I was so relieved that the gums started to show improvement almost immediately. I gained a healthy respect for Tongan medicine from that experience. I have been on some large modern ships that have many sophisticated instruments to keep them on course. This is very different from the non-instrument navigators I relied on in the little islands of the South Pacific. These helmsmen learned to be finely attuned to nature. Even the color of ocean and the shapes of clouds have meaning to seafarers who have observed them for many years. I admired how the navigators of the miniscule boats had an innate sense of where they were from the feel of the waves or swells on their hands, the direction of the wind, as well their position in relationship to the stars in the sky. The celestial bodies definitely played an important role in ancient ocean navigation. Stargazing is almost becoming a lost art in the Pacific. Fortunately, certain individuals are inspiring many of the younger generation to study the stars again. There are also non-profit organizations, like the Hawaiian Astronomical Society, The Polynesian Voyaging Society, as well as others. I recently wrote about the Polynesian Cultural Center. One of the newest displays there is a locally carved double-hulled canoe called the Iosepa. It is seaworthy, and it is taken out by experts who train students from the Brigham Young University – Hawaii in the art of navigation. 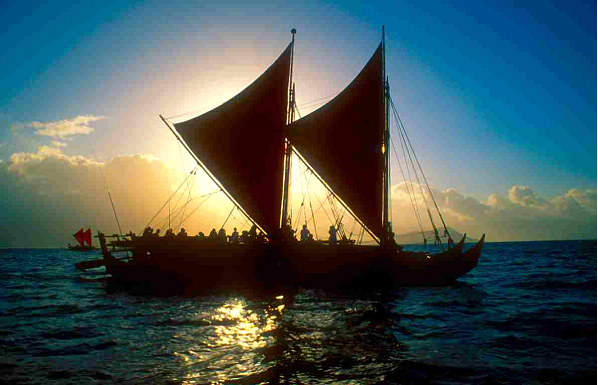 In the 1970s, The Polynesian Voyaging Society constructed a double hull canoe and named it the Hokulea. 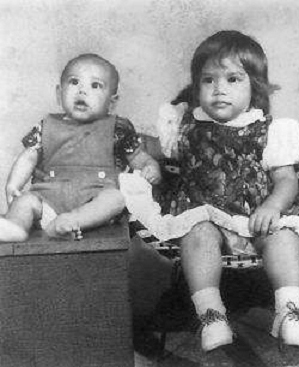 As a young man, Nainoa Thompson was taught traditional navigation by Mau Piailug, a Micronesian master. He became well acquainted with the stars and the other natural signs nature gives. Nainoa spent hundreds of hours studying the stars and the sky in a planetarium at Hawaii's Bishop Museum. I have recently been to this museum, and it is very impressive. 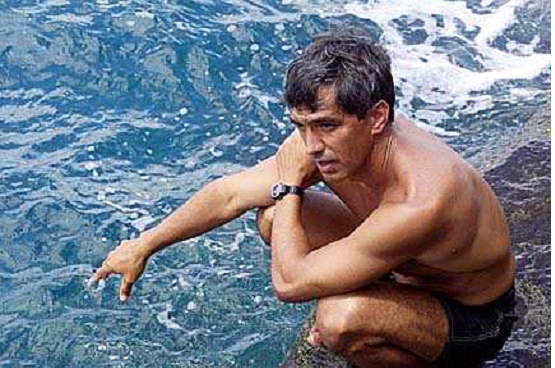 With all of this knowledge, Nainoa was able to make a historic voyage from Hawaii to Tahiti and back again without the use of modern-day navigational tools. There is one main star the navigators look to, the one that does not move. It is called Polaris, and this beacon light has directed many mariners to safety over the ages. By learning where the other stars rise and set in relationship to Polaris, the navigator can steer his boat with confidence. The celestial bodies in the heavens provide direction no matter where you are. This also includes the sun, the moon and the stars. There are also pairs of stars in the heavens that cross the meridian at the same time. These are called pointers because they always point to either the North or the South poles as they arc across the sky. Most of us are familiar with the Big Dipper, but there are several others that can also point the way. Signs of land approaching can be found in the amount of ocean froth, number of birds, and the presence and colors of clouds. My scariest experience was traveling in a tiny wooden boat as a navigator was attempting to get us out into the open ocean without hitting the reef. None of us wore life jackets, and the navigator actually stood on the front of the boat so he could see better. All of a sudden he disappeared into the ocean, having lost his balance. I thought we were all doomed, until he reappeared and continued on his navigation as though nothing had happened. I owe my life to several Polynesian ocean guides. One tradition I learned about when we lived in Tonga was their unique celebration of the New Year. The people of Tonga take New Year’s very seriously. When we lived in Tonga, precisely at 12:01 on New Year’s Eve locals start walking. They are hoping to be the first to greet their relatives and show their gratitude and love for them. Tonga, until recently was the first country in the world to greet the New Year. That is because it lies very close to the 180th parallel (12 hours ahead of Greenwich). It sits directly on the International Dateline. These friendly islanders often send messages or food if they are unable to walk the long distances. Tongans also value their relationship with God. The whole first week of the New Year is called Uike Lotu (prayer week). Church congregations meet and pray both morning and evening, always feasting in between, during the first week of the New Year. Traditionally, bands from all over the island take their musical instruments, which include homemade banjos, bass and guitars, singing their way from home to home and hoping for some provisions in exchange for their music. After midnight of the old year, you see people walking all over the paths and roads looking for their kin. When they meet, which may be halfway between their homes, they embrace and uma (kiss). Then they may sit down and have some cookies and Milo (chocolate drink) before leaving to find other relatives. The older people talk and reminisce about the old times and express their gratitude for being able to make it to the New Year. They reflect on people who have died and babies that were born. They also share their hopes for the future. 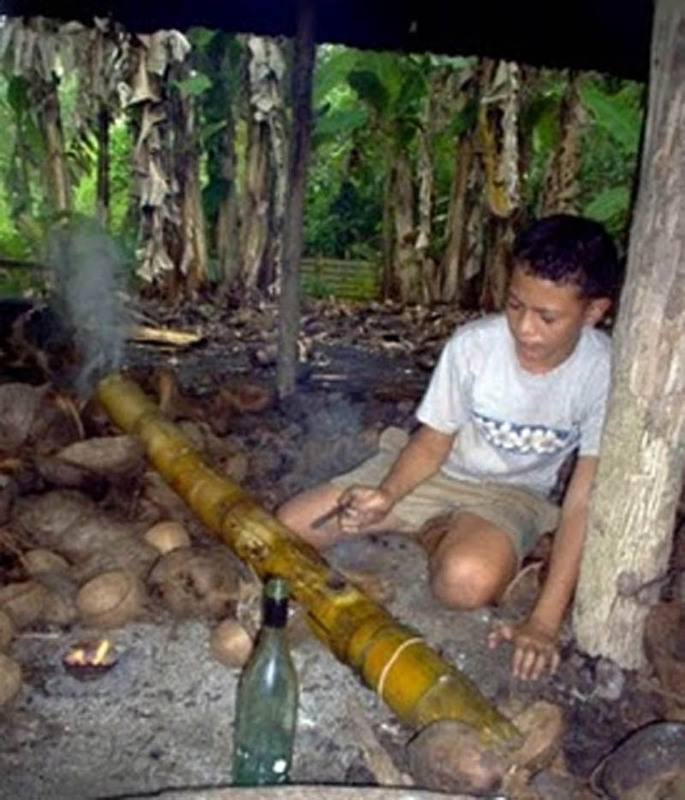 The young boys of Tonga construct fana pitu (bamboo cannons) and you can hear them all over the islands as their kerosene contents are lit. The boys will try hard to outdo each other in this cannon marathon. It sounds like a war is going on in the villages with all the cannons going off. After greeting all the relatives, and a long nap, most everyone heads for the beach. January 1st is during the hottest time of the year in Tonga, unlike the white snowy Christmases some other countries are used to. The whole family will go to the beach and have a swim. 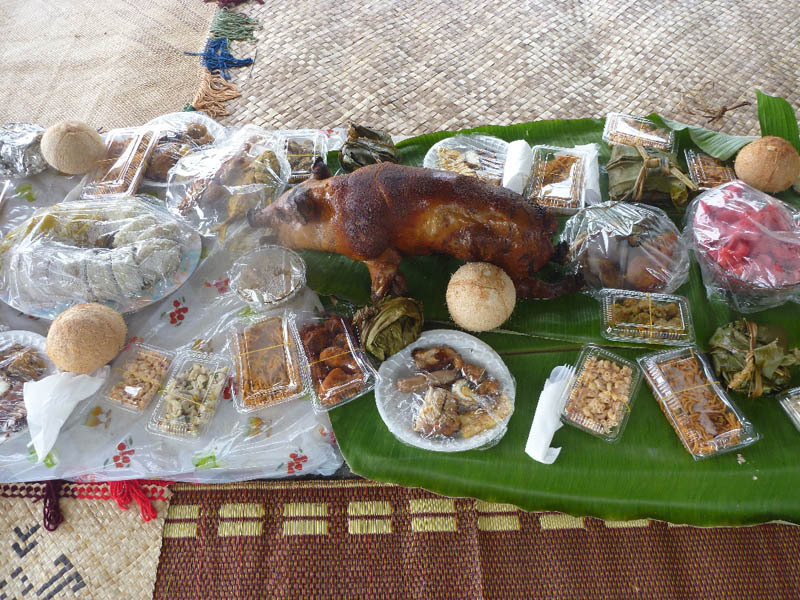 Food for the New Year is usually baked in an umu (underground oven), and may include lu pulu (beef, onion and coconut milk wrapped in taro leaves), root crops like taro, kumala (sweet potato) manioke (tapioca), and seafood. Mostly, the men fix the umu, but everyone enjoys it. Women make desserts like faikakai (caramel dumplings), Tongan pudeni (pudding) with custard, trifle (adopted from England) and other sweets. The Tongan royalty also have their own way of celebrating the New Year. On January 1, 2009 members of the royal family as well as cabinet ministers and distinguished guests received an audience with his Majesty King George Tupou V shortly after midnight. The monarch tries to strengthen his relationships during the New Year’s celebration. Truly, the people of Tonga are proud that they are one of the first countries to greet the New Year. Their monarch, Taufa’ahau Tupou IV fought for them to have this distinction so they would be the first in the world to offer up their prayers in Thanksgiving. They even have a hotel called the International Dateline Hotel. More recently, it has become popular in Tonga to be married the first week of the New Year. 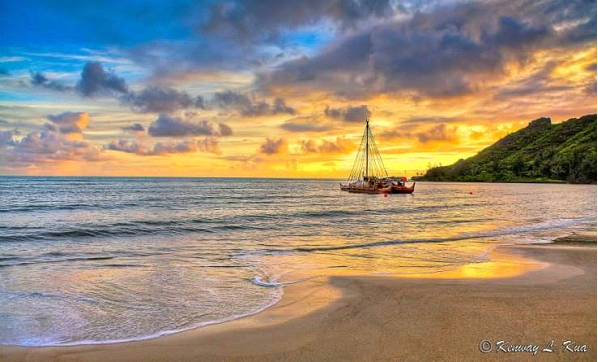 One of the most beautiful island countries in the Pacific Ocean is New Zealand. I had a chance to visit there some years ago. Because it is in the Southern hemisphere, New Zealand has winter in June and July and summer during Christmastime. We happened to visit during their warmer time. We had a new baby and stayed with my husband’s aunties (a term of endearment for older female relatives). We became quite well acquainted with the public bus system. We stayed in Ponsonby, a suburb of Auckland, the capital of New Zealand. I found that New Zealand is home to many ethnicities. The native Maori people tried hard to keep foreigners out, but today the majority of New Zealanders are of European descent. There are two main languages spoken, Maori and English. I felt like I had traveled in a time machine back about forty years having been raised in America. Going from automatic washers and dryers to wringer washers was quite a surprise for me (and not so convenient with a baby). One thing I truly enjoyed while we were there was their plunket nurses. The government provides supports services for the health, development and well being of children under the age of five. Even though I was only a visitor to the island, plunket nurses came to visit often, and checked my son’s growth and overall health. While we were in New Zealand, we were lucky enough to visit an enchanting place called Rotorua. It is located on the North Island. It reminded me of Yellowstone in Wyoming. There are 16 lakes and tall redwood trees. We enjoyed the geothermal forces, biking trails, walking tracks and Maori art and culture which was available all in one place. The living and breathing landscape of Rotorua was mesmerizing. We also got to bottle feed lambs, watch sheep sheering demonstrations and witness the kiwi bird in its natural habitat. Many visitors come just to soak in the mud of the geothermal pools. It has been found that hydrogen sulfide, a gas that is prevalent in Rotorua due to the thermal activity, has been discovered to enhance erectile function. Move over Viagra! We also discovered that Rotorua is one of the world’s premier mountain biking destinations. There are plenty of signs posted for bikers according to their skill levels. There are trails through lush ferns amidst rain forests, and even more challenging trails for those brave enough to race down Mt. Tarawera, a dormant volcano. 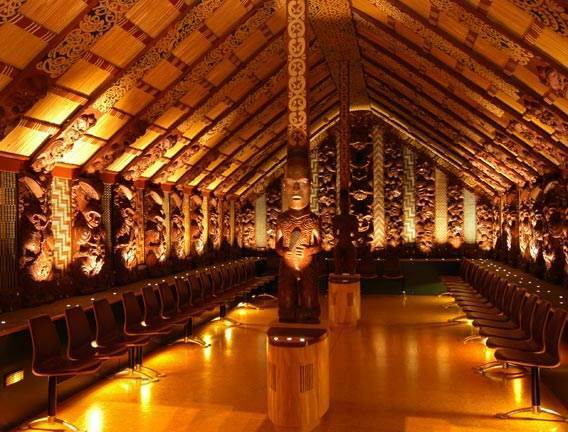 My favorite memories of New Zealand were learning about the Maori culture. The natives are considered Polynesians. The Maori are more than happy to share with you their love for the land and their traditions. They have beautifully carved buildings where they hold community meetings. There is a war dance called the “haka” where they chant, stamp their feet and use threatening hand gestures. They also open their eyes wide and stick their tongue out in an attempt to scare the audience. The haka has become quite popular at the beginning of rugby games. I also enjoyed learning the lingo of New Zealand. They use British English, and so I learned that candy is called “lollies”, diapers are “nappies”, and a stroller is a “carriage.” It was fun learning the different terms for many items. We also learned to use a different currency since they used British pounds back then. I feel so lucky to have experience the land of the long white cloud, New Zealand, and hope to be able to return again. Growing up with four seasons, we almost always kept our shoes (and sometimes socks) on outside and inside the house. Only on the hottest of days during the summer, did we go barefooted. So when our little family relocated to the South Pacific, I was curious to learn that it is customary to leave your shoes on the porch before entering a home. 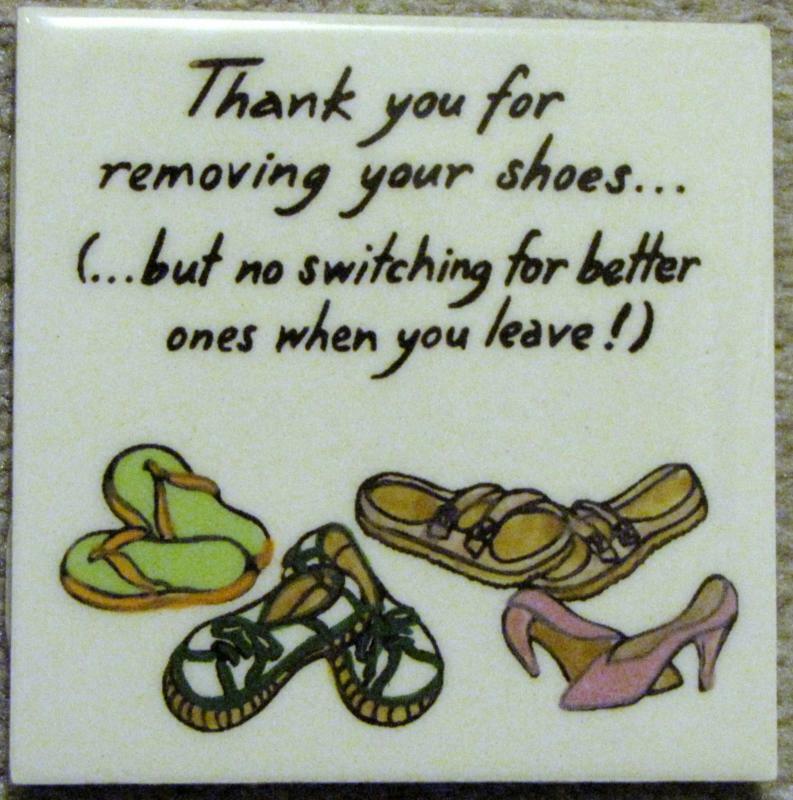 It took me quite a while to remember this tradition, often finding myself as the only one in the group with my shoes still on in the house and then apologizing profusely. 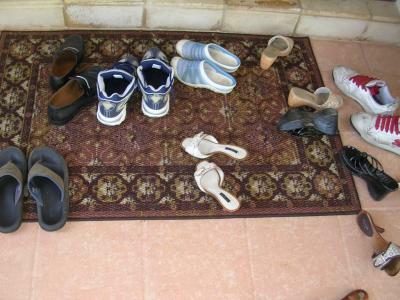 In Hawaii, where we now live, home owners often put little signs at the doors to remind guests to remove their shoes. There may be a little wood or metal rack specifically for storing shoes just outside of the front door. Most locals are aware that tourists may not be educated in this practice, and so in an effort not to offend them, they say “no need”. My dear Dad came to stay with us for a while in Hawaii. He is of Scottish descent and has lived all his life in a colder climate. You rarely see him with bare feet, even in the house. He has very tender feet and does not even like the feel of sand on them. I did not force him to alter his routine while he stayed with us. My own feet have toughed a bit while living in the islands. Actually, I prefer to go bare footed and can hardly wait to take my shoes off when I have been away. Then there is my husband, who was raised in the islands before going to school in a cold climate. He still can’t make up his mind whether to leave his shoes on or off, and I discover his shoes in the oddest places throughout the house! He told me that the first time he saw snow he thought it looked fun to run in and attempted it shoeless! He quickly learned that doing so was quite painful. In the Fiji Islands, where we have visited, there are certain tribes who get the coals in the fire burning, and then show their bravery by walking on them unprotected. I suppose their calloused feet make it much easier, having gone without shoes most of their lives. Since we have so many different cultures here in Hawaii, it is good to consider the owner of the home as you enter their abode. A telltale sign would be if there is a pile of shoes or slippers at the front door. That is what I look for when I pay a visit to someone I do not know well. Often I find a pair of attractive shoes that may actually fit me and wonder what would happen if they would notice if I left mine and took theirs (Just kidding)! In scripture, it tells of prophets removing their shoes when they are on “holy ground”. The same is expected in some mosques or chapels today. A person’s home should be considered their inner sanctum. Consideration of a person’s customs and traditions shows respect and honor. It is always good to learn whether you need to take your shoes off at the front door. Aloha! 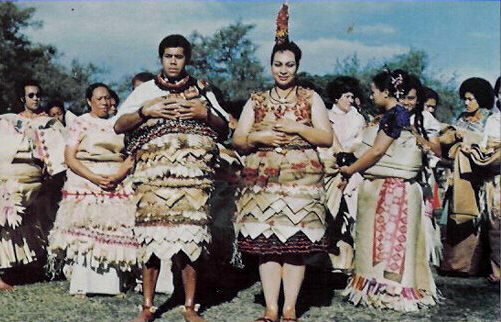 My first experience attending a royal wedding was when we moved to the island of Tonga. We received an invitation for the Imperial nuptial. I did not know what to expect, but was informed that I must wear gloves and a hat. Tongans must wear traditional clothing, but since I was a foreigner, I wore a long blue empire waist dress with a matching hat and gloves. Princess Salote Pilolevu, daughter of the reigning monarch was to marry Tuita, a cousin. Tongan Royals must marry in the family to retain the strong royal bloodline in order to continue the true line of succession to the throne. That was taboo in the society I grew up in, so it took me a while to get my brain around it. 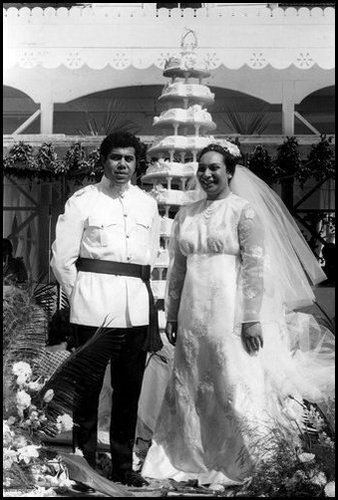 I recollect the young beautiful Princess Pilolevu in her wedding attire, and what a contrast it was to bridal gowns I was used to seeing. Extravagant feasting, mostly provided by the commoners, was indulged in by all. There were polas (large wooden trays lined with banana leaves) piled high with whole pigs, lobsters, fish, beef and oodles of local root crops and luscious fruits. The finest the Kingdom had to offer was displayed for the grand occasion. It was a far cry from the quaint receptions of my friends and family with bowls of mints and nuts as refreshments. Etiquette and decorum were uppermost in the minds of all involved. There was quite a bit of bowing, curtsying, and even crawling on the ground by commoners around the imperial family members. I remember how “star struck” I was when it was my turn to greet Princess Pilolevu. She was very refined in her mannerisms. I had practiced my curtsy well ahead, but it still felt awkward. Of course, the activities of the whole island kingdom were put on hold in celebration for the wedding. There was dancing, including whole villages which donned skirts of leaves, feathers and mats all handmade from what the land provided. 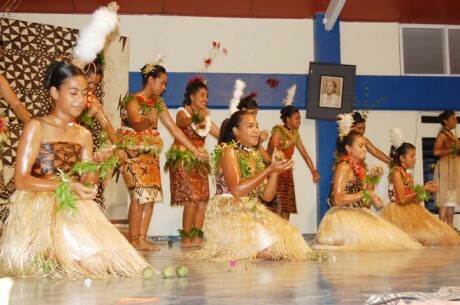 Months of practice had gone into preparation for a lakalaka, the Tongan National dance. One lakalaka could last as long as thirty minutes, and sometimes seemed it would never end. The song writer and choreographer would usually base the dance on a legend or history of the islands. Another notable difference between typical Western and Tongan weddings is the cake ceremony. The wedding cake is usually more than ten layers. After the couple has share a piece with each other, each layer of the cake is presented to a person who has played an important role in the wedding. It is their way of honoring those who have helped them. In 2012, there was another royal Tongan wedding. Again, close cousins were united in matrimony. The son of King Tupou VI, the Crown Prince Tupouto’a Ulukalala and Sinaitakala Fakafanua (26th in line for the throne), were united amidst controversy regarding the wisdom of carrying on this age-old practice of arranged marriages. 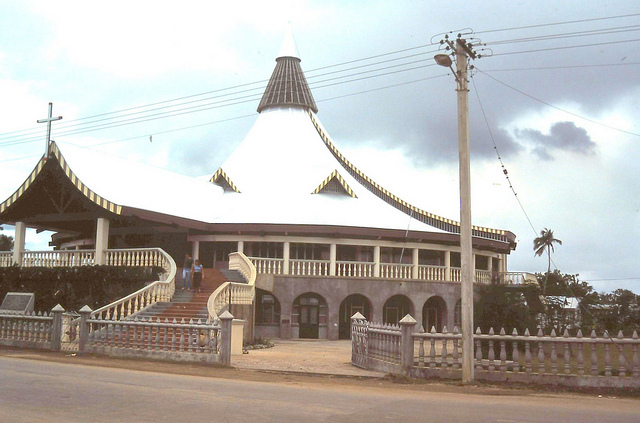 Interestingly, modern day weddings in Tonga are usually a mixture of British style weddings and traditional Tongan. Family obligations are very important in Tonga, and many sacrifices are made by close and distant kin, which becomes a competition in many instances. It is not unheard of today for the line to include ten or more bridesmaids. Gifts of tapa cloth, quilts, fine woven mats and great deals of money are often lavished on the couple. Hopefully you can experience a lavish Royal Tongan Wedding during your lifetime. Once upon a time, I naively thought that “time” meant the same thing to all people. I discovered that the meaning of time varies greatly from one country to another when I traveled with my husband to his small island kingdom of Tonga. Having been raised in mainland America, time is usually equated with money. We find our days planned and scheduled, measured in minutes with rarely a one wasted. We even schedule our leisure time! When we moved to Tonga, not only did I feel like I had traveled in a time machine, but I had a paradigm shift in the land where time begins (since they are right on the international date line). Tongan time was much different than what I had grown up with. The pace of things in Tonga depends upon many different things: the King and proper protocol, the weather, national holidays and festivities, funerals, social and family obligations, amongst others. Even greetings are not hurried. A simple “hi” is not enough. On meeting someone you know, obligatory kisses on the cheek and phrases like “thanks that we are still living”, “thank you for coming”, or “thank you for traveling” are appropriate. Your greeting also depends on whether you are coming or going and how many people you are talking to. Besides the normal Tongan language used by commoners to speak to one another, there is an honorific language used when speaking to chiefs or nobles, and a regal language used to speak to the king and royal family or when praying. There is no hurrying or scheduling if you are in the presence of one of the royal family. Everyone waits on them, including bowing, providing food, and more waiting. 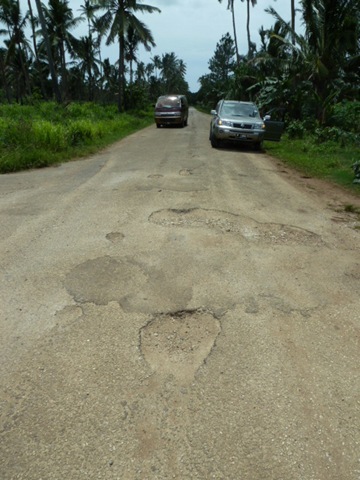 Weather affects time in many instances, because the infrastructure of Tonga differs greatly from more developed nations. Rains can cause delays on the roads, as many of them are not paved. I was on a bus one rainy day that had to dodge big puddles on the muddy road. The tire could not handle the abuse and gave out. We had to get out of the bus and wait for another one to come. There was no AAA or tow truck services we could call to help us. Most bus drivers have become mechanics, out of sheer desperation. High temperatures also affect the ability to work since there are very few air conditioned facilities . It can get very hot and muggy in Tonga. There is no set time to eat in Tonga. Basically, a huge pot of “haka” (root crops) is boiled or cooked in an underground oven (‘umu), from which the family eat whenever they get hungry. They just prepare more when it runs out. We traveled with some guests from the mainland USA to a small island in the middle of Tonga. They served octopus, lobster and fish in the morning together with their roots crops and coconut juice. For Westerners, this can be quite an adjustment! For many of the little islands, there is no set time when the plane will arrive. It is influenced by too many variables. We waited practically all day for a plane ride back to the main island, which can be hard on the nerves, unless you are used to it. Being on time in Tonga actually means you are early, and being late means you are on time. Punctuality is of no concern. Because of this, I learned much more patience and tolerance in Tonga than I had ever had before. When I was a young girl, we played hopscotch, jump rope and jacks. In Tonga, primary school girls learn to juggle (hiko). Many of them continue juggling for fun and later on for competitions. These jugglers develop great hand-eye coordination and keen concentration skills. The art of juggling is not taught to the young boys of Tonga, although there are some who do it secretly, but it is mostly considered a woman’s talent in Tonga. If you asked the average Tongan, they may not be able to tell you the origin of juggling in the islands. However, a common myth is told about a blind woman named Hikuleo, who was the head goddess of the underworld. She would stay in her own house, because if she were to leave her home, there would be an earthquake. She would steal the eyeballs of anyone who attempted to approach her in the underworld unannounced or without permission and keep them in a wooden bowl. She would call to her girls in the underworld to come and juggle with the eyeballs. Because of this story, superstitious Tongan girls will never juggle at night, since they are afraid that their eyeballs may be stolen. 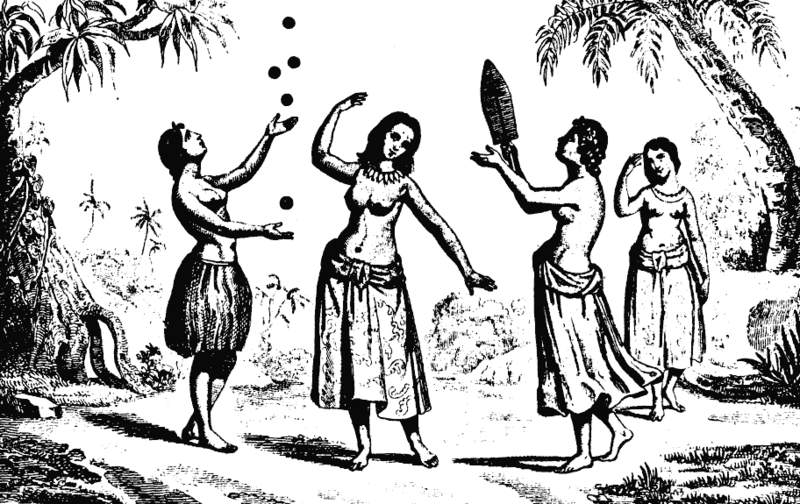 In Tonga, juggling is not usually done with balls, but with small fruit like tangerines, limes or tui tui nuts. 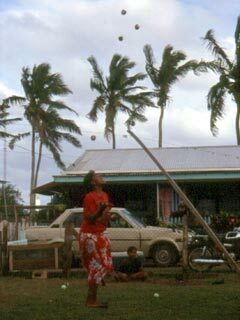 When we lived in Tonga, what amazed me was the number of objects they could juggle all at once. I have seen as many as ten fruit being juggled at a time. Five was a common number to start with. Often they would have a bowl of extra fruit nearby so they could grab and add one more to the circle. I think because the girls start so young, it seems very easy to them. Most Tongan children do not have a barrage of toys, like some children in wealthier countries do, so they have to create their own fun. This is an inexpensive talent to develop. Besides the coordination and concentration skills learned from juggling, I believe it is a good preparation for motherhood, when women learn to juggle babies, housekeeping, cooking, being a spouse and other familial responsibilities. To help in keeping the rhythm going during their juggling, the Tongans sing a little song. It puts them into a trance which helps their concentration. Once someone in a village starts juggling, the others want to join in. Before you know it, there are several young girls standing, kneeling or sitting, all the while laughing as some drop their fruit. The last person to drop all of their fruit is viewed with admiration. Juggling is considered a game for amusement sake. They do not do it for entertainment, like in a circus, but more of a fun little diversion to their chores and schoolwork. Clowns in a circus usually juggle with a simple figure-of-eight pattern, which involves throwing the ball up through the middle and over the sides. The girl and women jugglers do it in a circle and it can get very high, depending on how many items are being used. It really is amazing to watch, and hopefully it will not become a lost art. In 1978, The Los Angeles Times wrote that Nuku’alofa, the capital of Tonga had more jugglers per square mile than any country in the world. It could still be, but it is now more commonly found in the villages than in the capital. If you are fortunate enough to capture women juggling in Tonga, consider yourself blessed. Your visit to the Kingdom will be enriched by learning a little of the Tongan beliefs and history. 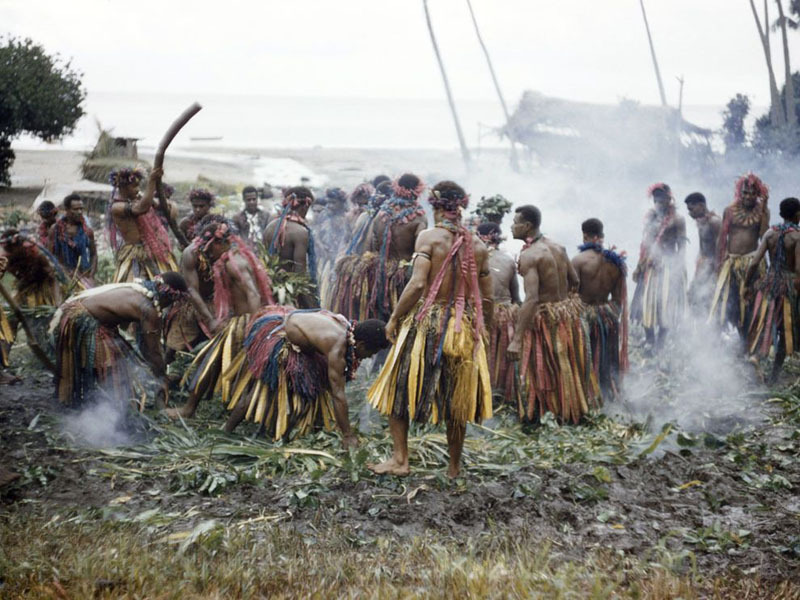 After living in Tonga a short while, I observed that the beautiful people of the islands have strong spiritual inclinations as well as superstitious beliefs. Since the eighteenth century, Tonga has been a Christian nation. Worship is a central characteristic of most Tongan people. Even today, the beating of drums in the villages signal the time for prayer or choir practice. 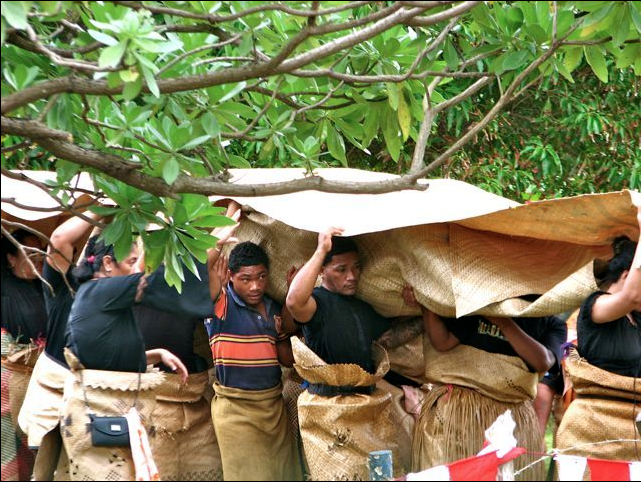 Tongans love to sing to prepare for song festivals and as part of their daily worship. Religion is such a part of daily life that Tongan statute includes it. It is unlawful to open a store or shop on Sunday. Tonga is very peaceful and quiet on Sunday. The monarchy, nobles, as well as the commoners are encouraged to attend church. Families dress up in their best clothes to attend church. Some of them wear European style hats and elaborate fabrics that shine or sparkle to their services. Sunday is also the day that the best food is prepared and shared with neighbors so no one goes hungry. 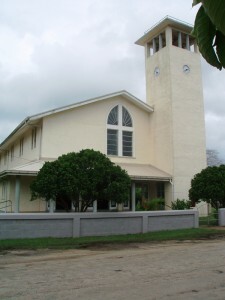 Christian denominations in Tonga include the Free Wesleyan, Roman Catholic, and Seventh Day Adventist Churches, as well as The Church of Jesus Christ of Latter-day Saints (Mormons). 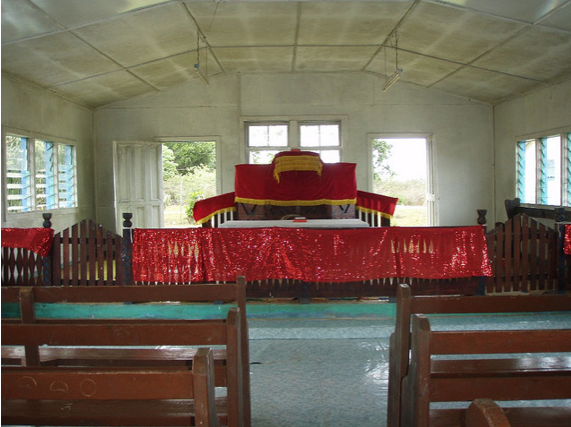 There are many church schools throughout Tonga. 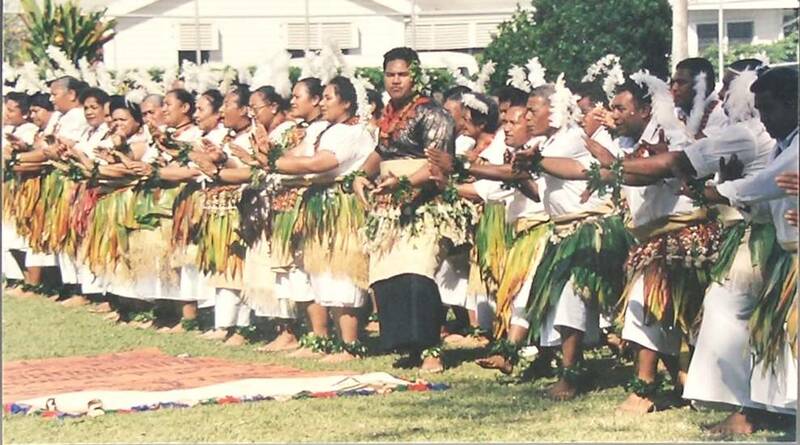 Uike Lotu – the first week of every year. Some Christians gather morning and evening each day of this week for prayer, worship and feasting. Toetu’u – Easter camps are held in many churches. It starts on Friday, and they feast, worship, play sports and sing. Katoanga Misinale – Mission Giving or Stewardship Sunday is held the last part of the year. This tradition includes making a financial offering to their church. They donate thousands of dollars to build churches for the benefit of their fellow saints. Po Le’o – The last day of the year (New Year’s Eve) is a special day of celebration and worship. They give thanksgiving for making it to the end of the year. At midnight, they try to be the first one to greet their relatives in the new year. 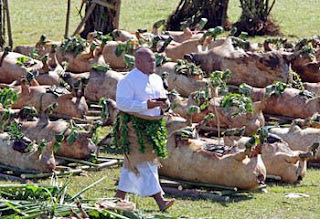 Tongan traditions are intertwined with religion. Several superstitions are woven into the fabric of Tongan daily life. My first experience with this occurred when we passed a graveyard while riding our bikes. I was whistling, and my wide-eyed friend told me to stop it. I was surprised when he told me that the whistling will wake the spirits of the dead in the graveyard, and that they would follow me. Another time, while we were cleaning a grave, I noticed some black rocks that seemed to distract from the beauty of the place. I went about removing them until my husband informed me they were very special volcanic rocks (from another island), and that I was not to remove them, or something dreadful might happen to me. Also, they have a strong belief that evil spirits can, and do, enter your body. They call it puke tevolo (devil sickness). They crush certain herbs and plants and smear them all over their body, including their hair, to get rid of the demons. Another superstition is that you should not touch your father’s head, and especially do not eat your father’s left overs. There are many more superstitions, but suffice it to say, they have not totally moved away from their ancient Tongan beliefs, even though they adopted Christianity. 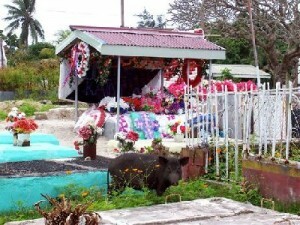 Light years ago (it seems) I attended my first Tongan funeral. My husband had secured a teaching position at an educational institution on the main island in the Kingdom of Tonga. As a mixed couple (Tongan/American) I was trying very hard to fit in to this new culture. 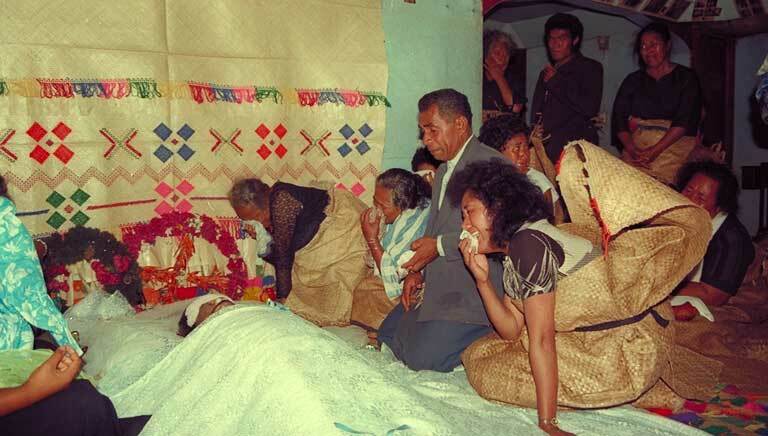 My first putu (funeral) in the Tongan culture was poles apart from the run of the mill funerals I was used to. We were at a dance where my husband was chaperoning. It was announced that a good friend of his had passed away unexpectedly. The man was also a student at the school where we lived. I was thrown deep into a traditional quandary. My husband informed me to change into black clothes. We walked to see the spouse and children of the deceased. The widow was unconsolable, which was understandable given the untimeliness of her husband’s death, as well as the number of children she was now solely responsible for. She was wailing, loudly, and pounding her head and breasts. I was hoping someone would slip her something to calm her down a bit. No matter what people did or said, the wailing continued….all that night and into the wee hours of the morning, and still did not stop when the body was in the grave. There was no mortuary, no embalming fluid, nor casket for the body. After hours of the incessant lamenting, I thought she would wear down and rest for a moment, but there was no relief. Her small children clung to her skirts, all wailing as well. Family and friends arrived in black, most wearing large frayed mats around their waists, some covering their backs and up over their heads. It appeared to me that some had picked up the floor mat from their home and wrapped it around them. The women dusted ashes from the outdoor kitchen in their hair which was let loose. It reminded me of the stories I had read in the bible of ancient times. The crowd sat cross legged on the ground singing hymns. A big pot of topai (Tongan round cakes) boiled to feed the mourners. Many pigs, horses, dogs and chickens also lost their lives that night, since it is customary to feed all that come for several days. I admired how everyone worked together to take care of business, leaving the wife time to grieve however she wished. Then the biggest challenge afforded itself. Before the burial, each person took their turn kissing the deceased. I was taken aback when I realized my turn was coming up. Could I really kiss a cold corpse, especially with everyone looking to see if this little palangi (foreigner) was up to the task? I could feel the hairs on the back of my neck prickle. I wanted to show them that I had it in me, so I bent down, partially closed my eyes and kissed the remains of my husband’s friend. When I stood up, I could feel the world spinning, and felt as if I was going to pass out. I could also feel my stomach churning, and hoped I could get away before I upchucked all that I had eaten that day. I had so much more to learn!